In his essay on The Last Temptation of Christ, the late Roger Ebert says of Scorsese: ‘He is a filmmaker of the city, of bars, clubs, bedrooms, kitchens, nightclubs, boxing rings, pool halls and taxis. On location in Morocco, he found vast, hostile expanses of hard soil, distant mountains and struggling vegetation. The sun is merciless. This is an Old Testament land, not hospitable to the message of love and forgiveness.’ Twenty-eight and a half years later, faith has again driven Scorsese outdoors, out of the city, and into another wilderness – rural Japan in the seventeenth century. 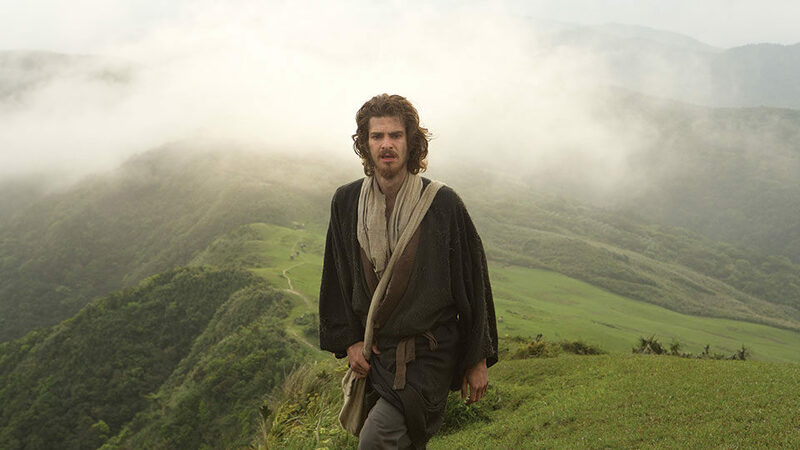 The trailer for Silence portrays it as a different film to the one cinema-goers will encounter. Fast cuts coupled with tremolo strings and intense, building percussion lend the trailer a sense of urgency which is wholly lacking from the film itself. This is in large part due to Scorsese’s complete refusal to include any non-diegetic sound. The film begins with an extended, almost uncomfortably long black screen, with only the ambient noise of a rural environment as accompaniment. The aural tone of the film is thus set from its very first second. This silence becomes more and more troubling as the film progresses, and as Rodrigues (played with a sensitive combination of warmth and naivety by Andrew Garfield) faces ever increasing hostility. In the film’s early scenes, this hostility is translated into an ambiguous sense of place, with Japan being made to feel disorienting and often insurmountable. Rodrigo Prieto, who so effectively documented the minute details of decadence in The Wolf of Wall Street, proves just as impeccable a collaborator for Scorsese here. A particularly beautiful shot shows the priests descending a tall set of stairs, but either Scorsese or Prieto had the beautifully simple idea of twisting the shot ninety degrees so that they descend not top to bottom but left to right. The result is an arrestingly decontextualized shot. The lack of the sound of footsteps only pushes the shot further towards abstraction. Whilst not urgent, Silence displays a phenomenal control of timing. In one scene, Scorsese delays a beheading just long enough for the audience to feel safe before abruptly unleashing it on us in a moment of extreme velocity yet extreme clarity. In the same scene, we are given a single, long take of a naked man trampling the image of Christ and then running out of the prison compound after being set free, with the officers then returning to their lodgings. Whilst not as showy as the famous Copacabana shot from Goodfellas, it is an extremely powerful take: shot from behind the thick wooden bars of Rodrigues’s cell, with the action choreographed shrewdly in the gaps between the bars. Without the use of any cuts, the audience is left to view exactly what Rodrigues views, in real time. The conventional grammar of cinema – at its heart shot-reverse shot – disintegrates into an extended moment of realism which aligns us with the imprisoned Rodrigues. Some critics, including the Guardian’s John Patterson, have called the film ‘overly devout’ (Patterson goes as far as suggesting a ‘leap toward the devout is needed to savour it [the film] fully’). This is nonsense. I am not a person of Christian faith, yet did not feel the need to make any ‘leap’. Prieto’s camera usually maintains a marked distance from the characters, matching the inscrutable silence that permeates the film. The events which occur are presented to us without moralising – Scorsese respects the audience enough to let them reach their own judgements. There is a moment where Scorsese has Rodrigues hallucinate his own reflection turning into Christ’s likeness. If it seems too unsubtle an image, too spelled-out given the Rodrigues-Christ link has already been teased out in previous moments, and too much of a self-parody given Scorsese’s oeuvre, it is. But then the image comes abruptly crashing down around us as the plot pivots into a new direction which sets the course for the rest of the film. The pivot is wholly unexpected exactly because of what immediately precedes it. Thus, a moment which at first seems indelicate is shown to have a very specific and very effective purpose. Whilst Garfield and Adam Driver give extremely solid performances, Liam Neeson delivers the standout performance among the Portuguese priests. The nuance and subtlety of his performance creates a perfectly ambiguous character – exactly what the role demands. The Japanese side of the cast is, on the whole, extremely strong. Issei Ogata, playing the chief inquisitor, is a particular standout. He delivers a terrifyingly sinister performance which nonetheless somehow never totally eradicates the audience’s sympathy. Though they share the same cinematographer and similar runtimes, The Wolf of Wall Street and Silence are vastly different films. Whilst the former is a comedy exploring excess, the latter is a sombre work of immense control. This is not to say Silence totally lacks humour. It is funny each time the Judas figure Kichijiro turns up and begs Rodrigues, the very person he betrays, to hear his confession. It is funny that the Portuguese priests should use the few moments they have outside the claustrophobic confines of their Japanese hideaway to sit on a rock and sun themselves. Yet these humorous moments are few and far between, and Silence remains a long and at times taxing work. But do not let this put you off; this is exactly what it needs to be. Originally published in the Cherwell newspaper, 16 January 2017.